Since the discovery of the giant magnetoresistance (GMR) effect in 1988, spintronics has been presented as a new technology paradigm, awarded by the Nobel Prize in Physics in 2007. Initially used in read heads of hard disk drives, and while disputing a piece of the market to the flash memories, GMR devices have broadened their range of usage by growing towards magnetic field sensing applications in a huge range of scenarios. Potential applications at the time of the discovery have become real in the last two decades. Definitively, GMR was born to stand. 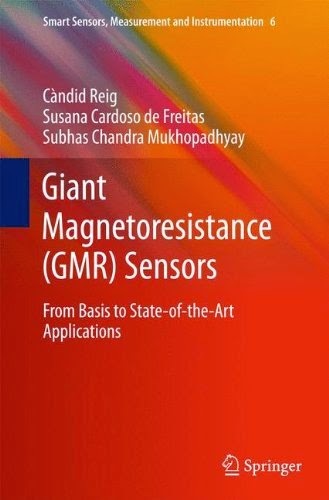 In this sense, selected successful approaches of GMR based sensors in different applications: space, automotive, microelectronics, biotechnology … are collected in the present book. While keeping a practical orientation, the fundamentals as well as the current trends and challenges of this technology are also analyzed. In this sense, state of the art contributions from academy and industry can be found through the contents. This book can be used by starting researchers, postgraduate students and multidisciplinary scientists in order to have a reference text in this topical fascinating field.